Massachusetts Guide to Genealogical Research - Tools and Finding Aids. Online Tools and Finding Aids. 1. These first two excellent, present day maps are provided free of charge by the Commonwealth of Massachusetts. If you do not have pdf reader software, please first download and install Acrobat Reader (it's free!) in order to view and print the two "pdf" maps below. It's definitely well worth your time and effort! 2. Take a look at the collection of map resources at Harvard University. Not many on-line digitized maps of Massachusetts, but this particular resource is open to the general public. Add it to your list of research repositories on your next visit to Boston! 3. 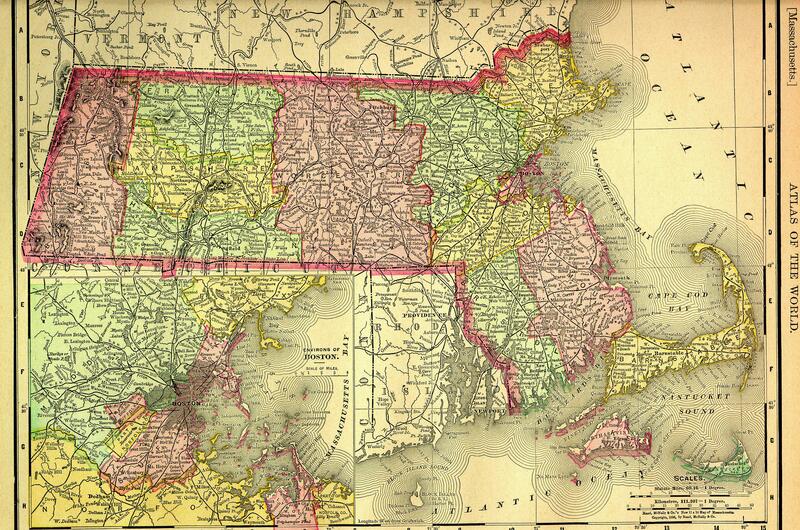 You can also view an 1895 map of the entire state of Massachusetts. 1. Want to know more about a particular town or city in Massachusetts? Try Commonwealth Community Profiles. It's your official state resource for finding information on the 351 cities and towns in the state. Each community page, which you can find alphabetically or by county, has links to information provided by state agencies. You can find public school and community profiles, summaries of municipal finances, state legislators, regional offices for a variety of state agencies, and more. Also included are links to official city/town and public school web sites, and other community sites that provide substantial civic information. 2. Can't locate that town in Massachusetts called Chapel Falls? Try the state's official directory to old names of towns and villages in Massachusetts. It's a great finding aid and research tool. 3. Need to know a town clerks' phone, fax, mailing address and hours of operation in Ashfield, or any another town? Then be sure and visit the official state directory of Massachusetts City and Town Halls. 1. The mother of all public library links in Massachusetts is MLIN. At this site you can find a directory to all public city and town libraries in the state, including the library's name, address, phone, fax, hours of operation, searchable links to on-line bibliographies (if available) and even the local Director's name! 2. The following websites are to both public and private research libraries in Massachusetts. Boston Russian Bulletin - Brookline - serving the Russian community. Dorchester Reporter - Boston - weekly paper. Eagle-Tribune Online - Lawrence - serving the Merrimack Valley of Massachusetts. Inquirer and Mirror - Nantucket's newspaper since 1821. Lexington Minuteman - weekly community newspaper. Marblehead Reporter - weekly community newspaper. Martha's Vineyard Times - island weekly paper. Needham TAB - weekly community newspaper. Newton Town Online - weekly community newspaper. Provincetown Banner - weekly paper. Springfield Valley Advocate - weekly for the Pioneer Valley. Wellesley Town Online - weekly paper. 1. Perhaps the best on-line directory to Massachusetts archive centers and research repositories (as well as around the world) is Columbia University Archives and Manuscript Collections. Guaranteed, you will not come away from this site without adding any bookmarks! The former does need some explanation. The National Union Catalogue of Manuscript Collections is a very powerful research tool. Spend time learning how to search this database. You will be amazed at what subjects you can find. Here, in one central database, you can search for documents related to Massachusetts from repositories across the entire country. For example, a search for "Massachusetts probate records" delivered no less than 14 "hits". Notes: Incorporated 1664; first town meeting held 1674. Records of Selectmen (1674-1851) including minutes of town meetings, correspondence, bonds and petitions, highway and school records, and militia records; Board of Assessors' records consisting of censuses (1837, 1840), tax tables, valuations, and other documents; tax lists, supplemented by orders, bills, and receipts, of town tax collectors; records of town clerk consisting of intention of marriage records (1809-1825); records of Overseers of the Poor including correspondence, notices, resolutions, agreements, and financial records; surveys, assessments of fees for road repairs (1717-1822) and other records of highway surveyors; land surveyors' records (1710-1825) chiefly consisting of plats; voting lists and other records of registrar of voters; and records of town treasurer and various financial committees. Includes records of Bristol County, Mass., court officials, specifically registrars of deeds, judges of probate, and justices of Court of Common Pleas, including estate records, wills and inventories, and guardianship papers of probate judges and cases, depositions, decisions, bills, and jury lists, of Court of Common Pleas. Also contains papers of Ephraim Tripp (1753-1825) who served in several town offices including selectman, town clerk, and assessor, reflecting his civic duties, personal affairs as merchant and estate administrator, and service in General Court of Massachusetts (1810-1812); records of estate of Silas Gifford (1714-ca. 1800); guardianship records; and financial papers of Tripp and his son, James Tripp (b. 1794). The citation also states the location of the material which is located at the Old Dartmouth Historical Society Whaling Museum Library (New Bedford, Mass.). Title: Wills and inventories of estates, Suffolk County, Massachusetts, 1628-1852. Notes: Microfilm. Waltham, MA : Graphic Microfilm of New England, Inc., 1957. 72 microfilm reels : positive ; 35mm. Originals in Suffolk County Probate Court, Boston, MA. Consists of wills and estate inventories for Suffolk County, Ma. Index volumes placed periodically throughout reels; index also on M2470-M2471. This particular collection is located at The Winterthur Library: Joseph Downs Collection of Manuscripts and Printed Ephemera, Winterthur, Delaware. What researcher would have thought Massachusetts probate records would be located in Delaware? Like we said, the NUCMC is a very powerful research tool. Records from all across the United States can be searched. Learn it, use it! Please note: These links are to commercial bookseller sites.